When Working Well With Men Director Jack Kammer served as a trainer for the National Fatherhood Initiative (NFI), he learned a simple and powerful workshop ice-breaker: “Please take three pipe cleaners and fashion them into an object that represents your father or other significant man in your life as you were growing up.” After a few minutes, the trainer asks if any of the workshop attendees wish to share their items and discuss what they signify. Some of the stories are happy and joyful, others are sad and painful. The idea is not to pretend that all fathers and all men are wonderful, but rather to make clear how deep, profound and important are our relationships — for better or for worse — with the men in our lives, especially when we are young. Here is the item Jack made at his first NFI session and often shared at others. Click the photo to read its description. 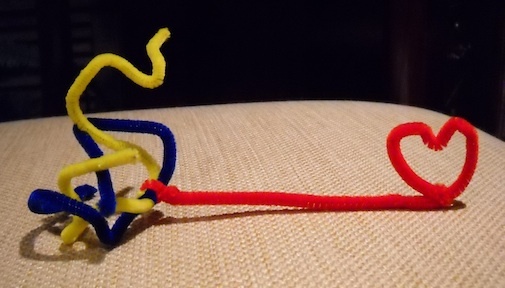 Send us a picture and description of your three pipe cleaners. We’ll post your picture here. And link it to your description here. Take a photo of your object. We may crop the photo as necessary for formatting on the website. ﻿Write a brief description — about 150 words or less — of what your item means to you. ﻿Do not use any personally identifying information in your description, neither your own nor the man’s. Your text will be linked from your photo, as in Jack’s, above. By submitting your photo and description you are granting Working Well With Men LLC a non-exclusive, irrevocable license to post them on the Working Well With Men website, pin them to Pinterest (with an abbreviation of your description incorporated into the picture; see example), Facebook, LinkedIn and other online facilities, and use them in other ways in furtherance of Working Well With Men’s mission. You are welcome to obtain your pipe cleaners anywhere you wish. Typically they are sold in large packs. For your convenience we provide an easy and inexpensive way to obtain just the three pipe cleaners you need, in exactly the colors you want, at our one-and-only Pipe Cleaner Store.